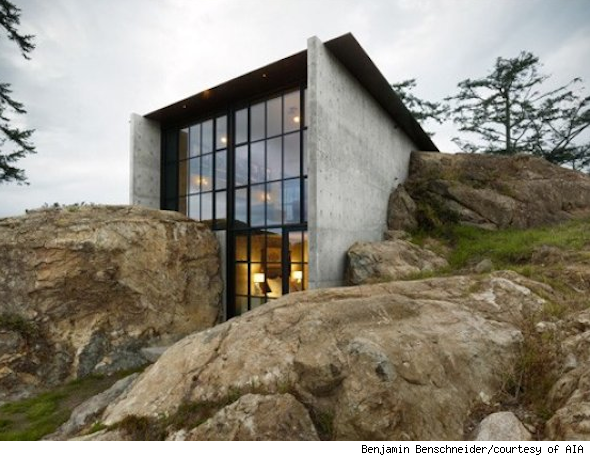 Ever thought of building a home embedded into a rocky mountainside? That's just one house that made the cut in the American Institute of Architects' 2012 awards for homebuilding excellence. From pads with glass roofs to environmentally friendly low-income housing, the AIA honored this year's most innovative projects around the country in four categories: one- and two-family custom residences; one- and two-family production homes; multifamily housing; and specialized housing. We promise you'll want to move in to every home. 1. One- and Two-Family Custom Residences. 2. One- and Two-Family Production Homes. View all 2012 AIA Awards Recipients. A 2,500-square-foot residence located on a steep site in Carmel-by-the-Sea, Calif., required added privacy and protection from strong sea winds while remaining open to dramatic ocean views. A precise refinement of the existing volume maximizes the unused breadth of the home and views of the Pacific. The central heart of the house is protected from strong seawater winds off the ocean by a glass roof, designed to allow clear views upward and to maintain a warm center space. The steel columns that anchor the steel cable and strut trusses are integrated into the vertical wood screen, matching the changing rhythm and yet independently identified by a deep charcoal color. When a sweeping breeze is needed, the large sliding windows between the office and the courtyard are easily opened to allow full cross ventilation. The house lives and breathes through the courtyard, and the clients live fully in this “large” room, even soaking in the Japanese Ofuro installed beneath the glass roof to watch the evening sky. The residence maximizes the openness and function of a limited square footage, taking advantage of a favorable climate to allow outdoor spaces to become integral to the experience and use of the house. Emphasizing organization and design quality over quantity of enclosed space allowed these clients to reduce the consumption of resources in the home’s construction and continues to make efficient use of energy in its occupation. Edgemoore is an affluent neighborhood in Bethesda, Md., a suburb bordering northwest Washington, D.C. Mature trees and gardens line the streets of this neighborhood, which is within walking distance of downtown Bethesda. Designed as a cube, the new house is approximately 2,200 square feet with no unused or underutilized spaces. The flat roof provides an additional 1,100 square feet of outdoor living space with views of treetops and the downtown Bethesda skyline. Fenestration in the ground-faced block walls, composed of varying sized rectangular and square openings, is arranged to optimize views of the green spaces while minimizing views of adjacent houses in close proximity. A series of landscape walls orchestrate the relationship between the street, required parking court and house. Interior spaces are open and light-filled with crisp detailing. Walnut flooring provides a rich base for white walls and millwork, designed in juxtaposition to the charcoal gray exterior walls. This house represents a deliberate departure in both the thought process and the realization of current building trends in the neighborhood. Instead of building a large house with pretentious ties to the rural past, this new house is smaller with a stronger relationship to the modern, urban area that Bethesda has become. The house is intended to be more site-sensitive and environmentally conscious and to provide comfortable, efficient living spaces. This project is an abstract remodel of a 1960s hillside house located on a west-facing ridge in Hollywood Hills, Calif., just below the Hollywood sign. To the south and west are canyon views; to the east is a protected natural ravine with a view of Griffith Park Observatory in the distance. A series of abstract indoor-outdoor spaces with framed views to nature are rendered in white lacquered cabinetry, white concrete epoxy floors, white plaster and white steel. One room pours into another, eliminating clear division or division between spaces and providing the illusion of weightlessness. The series of interconnected terraced spaces connect the rooms to each other and to the outdoors, lending further to the concept of an uncontained space with no rigid beginnings or ends. Air moves freely through a circuit created by the new design, so the home doesn’t have or need air conditioning. The contrast between the interior and exterior of the house is intentional and total. While the interiors are light and fluid, the exterior walls are finished in a black, monolithic Meoded venetian plaster system. These deep black plaster walls act as a net, holding the home in place while still allowing it to move in interesting directions. The black exteriors add definition to an interior that tries to escape it. Although the footprint is still small, it is now rivaled by giant views through the floor-to-ceiling glass-sliding panels. Exteriors open up the breathtaking hillside, taking advantage of surroundings once disregarded by the original home. Conceived as a bunker nestled into the rock, the Pierre -- French for "stone" -- celebrates the materiality of the site and the owner’s affection for a stone outcropping on her property. With its rough materiality, which encompasses stone, green roof, and surrounding foliage, the house disappears into nature from certain angles. To embed the house deep into the site, portions of the rock outcropping were excavated using a combination of machine work and handwork. The contractor used large drills to set the outline of the building, then used dynamite, hydraulic chippers, a selection of wire saws and other hand tools, working with finer and finer implements as construction progressed. Excavated rock was re-used as crushed aggregate in the concrete flooring. Excavation marks were left exposed on all the stonework, a reminder of the building process. Upstream, the guesthouse and office/exercise structures inhabit the narrow valley meadow with its forested edges. Mirroring the path of the nearby stream, these utility and activity spaces are clipped to and detached from the main house. They share simple massing and wood siding, discreetly revealing the composition of the roof structure. Downstream, the main building’s large living space opens to a full view of the deep lake, broad sky and weather. With their longer spans, the primary spaces are framed robustly in wood and steel. The southern glass wall extends toward the waterfall at one end while focusing on the lake at the other. A linear steel beam projecting through both east and west elevations marks circulation. The beam is the fulcrum of the south edge that inflects upward to catch the sun above the ravine’s rim. Throughout the house, rock extrudes into the space, contrasting with luxurious interior textures and furnishings. Interior and exterior hearths are carved out of existing stone and left raw -- much like the master bathroom sink and the powder room, which are fully carved out of the rock. Relic Rock is designed with a simple, flexible, sustainable prototype building system that is adaptable to a broad range of different climates and terrains. This prototype architectural solution sits lightly on the land, with cantilevered floors that minimize site disruption. A distinctive connection to nature is achieved by dissolving the division of interior and exterior space. Relic Rock’s modular prefabricated architectural system is based on a three-dimensional structural grid consisting of a 7’ x 7’ horizontal module, a 1’-3” vertical module, and a 21’ x 21’ structural bay. All structural and building components are designed and standardized to this 3-D grid. The exposed structure consists of a simple set of standardized components, much like an “erector set” of beams, columns, connectors and plates that are assembled into components in the shop and sequentially transported to the jobsite for erection. The floor and roof plates are constructed with nine individual 12-gauge press-formed panels bolted together to span the 7’ x 7’ module. Glazing, fascia, vertical screens, case work, wall panels, plumbing, electrical wiring, ductwork, insulation, stairs, and handrail are all designed in accordance to the 3-D grid and integrated into the structure, thereby allowing automated fabrication with precise and efficient construction. BIM-enabled Integrated Project Delivery through a collaborative developer-architect-contractor team complements the building system and results in efficiencies that are unable to be realized through traditional project delivery methods. Components modeled to exact dimensions by the architect and contractor within the model result in precise fabrication of structural, glazing and architectural components that fit precisely together with zero on-site collisions or rejections. The software complements the simplicity of the building system by providing the integrated project team with precise construction coordination, accurate bidding, 4-D scheduling and construction management methodology. Relic Rock has been granted the highest level of certification for green building by the nationally recognized City of Scottsdale Green Building Program. Winner of the “From the Ground Up” Competition, the LEED-Platinum-certified home considers the longevity and livelihood of the Near West Side of Syracuse, N.Y., a shrinking city affected by the migration of significant industry throughout the 20th century. Today, the neighborhood faces high unemployment rates and lacks space for creative industry. Affordable housing alone does not respond to the needs of the neighborhood; its vitality as a community is a question of sustaining livelihoods and the social diversity. Just as pockets of extreme blight and vacant lots can weaken a neighborhood, adding density to the small-lot patterns of Near West Side with mixed social and economic activity will re-energize the community. Long-term operational affordability and low-tech passive strategies were of prime consideration during the design process when addressing the needs of a diverse population of potential occupants, including students and aging residents. A high-performance building envelope constructed of Structural Insulated Panels (SIPs) saves energy, improves comfort and reduces both construction waste and ongoing costs of ownership. A heat recovery ventilator circulates healthy, filtered air year-round, and efficient, hot water-based heating is delivered through a radiant floor, which also allows maximum flexibility in room planning. In the heart of San Francisco, this mixed-use SRO building provides 120 permanent, supportive studio apartments for very-low-income and formerly homeless residents, many with mental and physical disabilities. The five-story sustainable infill development remediates the site of a collapsed freeway with green homes, street improvements and neighborhood-serving retail. The design balances independence and security. The ground level includes a monitored “air-lock” lobby, property management, medical clinic and counseling suite, courtyard, lounge, program rooms, and kitchen and laundry facilities. These spaces are visually accessible throughout, creating a layered transparency and sense of depth and openness. Each unit has basic designer furnishings, a private bathroom and kitchenette, and an in-house phone to call other residents and the front desk. All units are close to the 300-square-foot average to preserve feelings of equity. The courtyard, second-level deck and roof garden provide social opportunities and address community concerns about sidewalk loitering. Units are reserved for chronically homeless residents with incomes at or below 50% AMI. The maximum income is $34,800 per year, with 42 units reserved for below $18,825. Residents pay 30% of income as rent, creating a monthly rental scale ranging from $0 to $870. The goal was to maximize a tight site to meet program needs and create gracious homes and community spaces. Focusing on the natural beauty of materials -- zinc, board-form concrete and salvaged wood -- and concentrating budget on the iconic corner, entry and shared spaces created a building with a strong identity and sense of place. At 276 units per acre, the dense development had a high open-space requirement, which was realized by complementing the courtyard with a roof deck incorporating a living roof, urban agriculture and gathering spaces. The building incorporates extensive security measures, yet conveys the impression of transparency and spaciousness through high ceilings, floor-to-ceiling street windows, open common rooms and corridors, and layers of glass panels. Designed with long-term durability in mind, the building currently rates 143 GreenPoints and surpasses California’s strict energy standards by 15%. The project intends to: (1) blend urban and natural desert landscapes to create a dynamic, public, pedestrian-friendly environment, (2) integrate local contemporary architectural vernacular with the demands of high-density 21st century residential design and (3) integrate green roof design and technology to enhance human experiences and ecological stewardship, providing landscaped space to every residence in the 7-story buildings within the site’s 65’ height limit. The architecture embodies a site-sensitive vocabulary of deep-layered shades, shadows, colors, textures and transparency. Overlapping and interconnected forms and voids create a diverse and provocative composition of space. Overhanging bridges and cantilevering landscaped terraces shade public pedestrian courtyards, creating shelter not just as covered space but as a serene sanctuary from the southwest desert. The landscaped courtyards are accented with water features, three swimming pools, spas and monumental public art. The central promenade completes the north end of the City of Scottsdale’s master-planned Marshall Way pedestrian connection in an active landscaped civic space lined with shopping, palm trees, fountains and a water fall that provides evaporative cooling and mitigation of urban noise. Each dwelling is a dynamic combination of layered interior space expanding uninterrupted into lushly landscaped private terraces up to 3,000 square feet. Landscaping is as important an element of the architectural composition as the physical expression of the buildings; 17 acres of roof gardens were constructed on the 13-acre site. Through technical innovation resulting from extensive design exploration, engineering and a multi-year research collaboration with Arizona State University, a terrace planting system was developed with a soil depth of 6-8” that facilitated the economical construction of landscaped terraces on every floor of the seven story structures within the 65’ height limit. The garden roofs provide a haven for urban wildlife, promote evaporative cooling, re-oxygenate the air, reduce dust and smog levels, reduce ambient noise, detain storm water, and thermally insulate and shield residents from the desert sun, all of which contribute to a sustainable urban environment. A community of Jesuits required a home and a center for their religious mission. The architecture reflects their commitment to simplicity, spirituality and intellectualism. Aware of their role as teachers and spiritual guides, the Jesuits sought a building that would serve as an exemplar of ecological architecture. This residence and apostolic center sits at the heart of a campus and houses Jesuit priests, offices, a chapel, community dining room, great room and library. The site is prominent and lovely, a steeply sloping hillside bounded to the south by mature European beech trees that frame distant views to Long Island Sound. The building rests on the shoulder of the slope, organizing its community spaces beneath the low plane of a garden roof, uninterrupted except by the monitor that lights the chapel, the spiritual heart of the building. All design decisions promote the smooth function of a combined social center, religious sanctuary and home, and they optimize the building’s environmental performance. Operable windows promote natural ventilation, reduce mechanical loads and admit winter sunlight onto dark concrete floors that absorb and radiate solar energy. Natural daylight floods the interior. Renewable materials line the building’s surfaces. The building overhangs its foundations, protecting the root systems of the giant beech trees that surround it and that shade the building’s southerly windows during hot summer months. The project is designed in the collegiate quadrangle tradition. Seven buildings totaling 275,800 square feet are woven together with shaded arcades and existing tree-lined walks into a sensitive historic corner of campus. Together, they create a careful composition and hierarchy of buildings and spaces, in keeping with the order of the original campus plan by [Ralph Adams] Cram, Foodhue & Ferguson. The result is an example of designers working within historic context yet reinterpreting the vocabulary in a contemporary and sustainable way. Residential accommodation for 650 students is provided on upper floors, which are highly modular while offering different bedroom types. The top floor also features a large-shaded outdoor terrace with green plantings. Each quad is completed by a “commons,” or dining space, the communal heart of the colleges. Built as independent volumes with their own shape and character, each has a visible timber structure holding the roof in place in an elegant manner. One servery provides food service to both colleges. Two master’s houses complete the community. Particularly innovative is the use of specially designed prefabricated bathroom pods in the residences. The pods’ uniqueness, practicality and affordability led to their inclusion in a special exhibit at New York City’s MOMA. The choice of self-finished and durable materials will require little maintenance over time. Both colleges achieved a USGBC LEED Gold rating. The project team encouraged a collaborative process that drew on input from every part of the university community to ensure the project’s success. For more information on the 2012 AIA Housing Awards for Architecture, visit www.aia.org.